Twelve-year-old Bonnie MacDonald — the beloved stepdancing, fiddling youngest member of Cape Breton’s famed Clan Donnie band — vanishes after a family party. There was no stranger spotted lurking around, but no one thinks for one minute that Bonnie ran away. Maura MacNeil, cousin to Clan Donnie, offers her husband’s legal services to the family as the police search for the missing girl. But fame attracts some strange characters and Clan Donnie has its groupies. So, it turns out, does lawyer and bluesman Monty Collins. Monty and Maura’s daughter, Normie, is much closer to the action as she gets to know her cousins, learns things she wishes she never had, and has nightmares — visions? — that bring her no closer to finding Bonnie. Her spooky great-grandmother makes no secret of the fact that she senses the presence of evil in their village — the kind of evil RCMP Sergeant Pierre Maguire left Montreal to escape. But he finds a vein of darkness running beneath the beauty and vibrant culture of Cape Breton. And he learns that this isn’t the only dark passage in the Clan Donnie family history. The story is both an engaging mystery and an exploration of the unique and enduring culture built by Scottish settlers in Cape Breton. It contrasts the innocence of young Normie with some very adult situations that she handles with the strength and wisdom of her ancestors. This story is irresistible. Multi award winning Canadian author Anne Emery shows off her Nova Scotia roots with her ninth full-length mystery novel. . . . it isn't long before murky family secrets bubble to the surface. The author's ability to say more with less invites readers along for the dark ride, and the island's Celtic culture serves as a stage to both the story's soaring narrative arc and a quirky cast of characters, providing a glimpse into the Atlantic Canadian communities settled by Scots over two hundred years ago. Once again, Anne Emery proves she's one of the best of Canada's new group of crime authors. 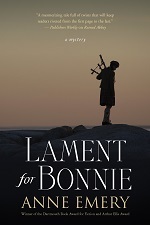 Lament for Bonnie is a fine mystery with terrific characters and a solid plot, but it's also an exploration of a unique Canadian culture: the Celtic musicians of Cape Breton, whose ballads and dances are part of our shared heritage. . . . This is an irresistible read from start to finish.